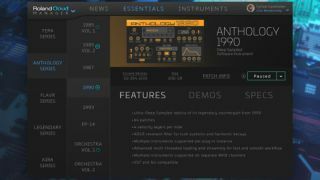 Roland has released a new version of its Cloud service that features a new Cloud Manager and bundle of effects too. The Roland Cloud Manager 2.0 update focuses on overhauling the user experience with a new interface and more functionality and promises to be both “intuitive and informative”. The manager now has two modes; system tray (or menu bar) mode and a full application mode. Whilst running in application mode on your desktop, Roland Cloud Manager now provides quick access to relevant news, information and your instrument library. In system tray mode Roland Cloud Manager continues to run background tasks like downloads, authorisation, checking for updates and other automatic tasks. Further improvements include setting up a custom path to store Concerto based instruments internally and on external storage devices. You’re also able to update all instruments with a single click, rather than having to redownload an entire instrument. If you’re subscription has expired, you’ll still be able to log in to Roland Cloud Manager to see new instruments, news, and updates. However, instrument access is still tied to a valid subscription or trial subscription. All updates come from user feedback, so if you have more suggestions for an upcoming update to the Cloud service, then Roland would love to hear from you. Head on over to the contact page on the Roland Cloud site to share your thoughts.